This smial has been set up by me. You are probably surprised by such a connection? Old Smaug and hobbits, you probably expected to see them on my frying pan (what, I have the equipment!) or barbecue… That’s what would have happened some time ago but one event has changed my life for ever. You probably all remember, the famous dwarf and burrahobbit expedition to Erebor in order to recover the treasure and what it resulted in. Well. Bilbo didn’t write everything the way it happened, in the book and I don’t just mean the issue with Gollum. When I fell into the lake depths, seriously injured, I lost consciousness and when I regained it, many days had passed and a battle was taking place nearby. The ability of our race saved me, we are able to close our nostrils and fall into lethargy so that we can last weeks, and even months on a small dose of air. 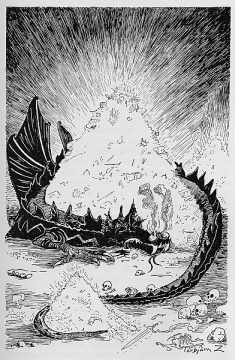 When one month later, at night, I crawled out from the bottom of the lake and hid in the thicket I wasn’t the same as before any more … From that fall my dragon screw shifted and I stopped being interested in jewels and gold, I became a disgrace to my race, in short: a vegetarian. I lived happily discovering the passion of a botanist, when one day I heard a light-heartedly kicked stone. I looked out from my underground quarters and I stood rooted to the spot! In front of me stood a real, petrified with terror hobbit! I tried many methods but finally a cup of wild strawberry tea unblocked him. It turned out that he is from a smajal called Croatia and he wandered here looking for adventures and elves (will those hobbits ever change? It must be a genetic defect..). He spent a few weeks with me and since I still had a lot of treasures hidden in different places left, we had enough of the best food and sweets imported from far away. 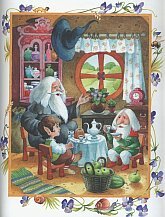 One day I invited him to stay as it would be happier for the both of us to be together, I reshaped part of the hill to make a house which turned out to be a good move as month after month new hobbits appeared in our neighborhood, some travelled further on and some stayed with us. They eagerly welcome new people, who have new tea making recipes, to their already numerous group. As we all know, hobbits are a very familiar nation, unfortunately some hobbits from our smajal have gone missing when they went away from the base… If you meet them somewhere, maybe you will be so kind as to help them return safely home? Thank you in advance!!! I would like to thank all the people that have found the missing, wandering about hobbits from our Smial and were so kind as to give them a ride, delivered them to our house or informed us of their place of stay. Images are copyright by their respective artists and publishers.